Does Tettra have a Slack bot? Our Tettra Slack bot helps you find answers quickly and keep your knowledge base up to date right from Slack. You have the option of receiving individual Tettra notifications wherever is most convenient to you - either email or Slack. Someone mention you in a page or comment? A new suggestion? Tettrabot will let you know. 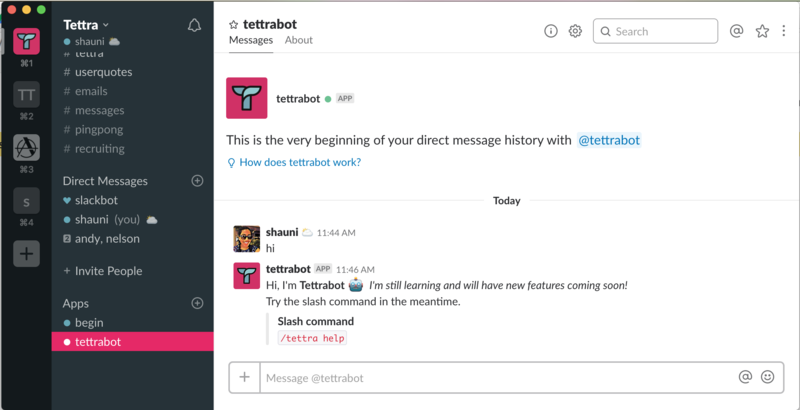 To enable Slack notifications from Tettrabot, visit your notification settings page. You'll be able to do everything you can with our slash command by mentioning or asking Tettrabot. Do you have ideas for what else you'd like Tettrabot to help you with? Let us know! Reach out to us via chat or just start talking to Tettrabot. Once you enable the bot, you'll find it in the lower left corner of your Slack app, under 'Apps' (press the + button next to 'Apps' if you don't see it there).